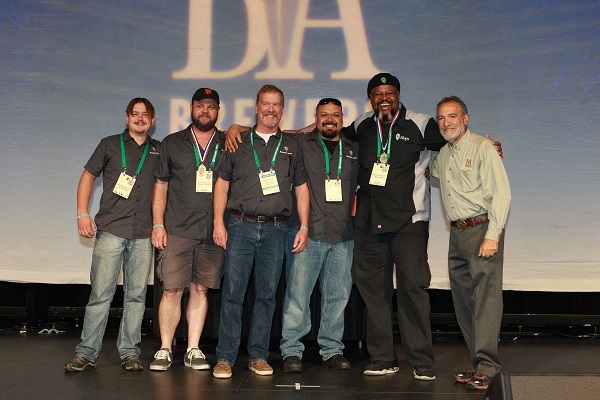 Two Gold Medals for BJ's at the 2015 Great American Beer Festival! The Great American Beer Festival was bigger than ever last week, including hundreds of new craft breweries. Throughout the course of the three-day festival in Denver, there were 750 breweries in the festival hall serving more than 3,800 beers to more than 60,000 attendees. The competition was even bigger – 6,647 beers that were judged in 92 categories. This was a 20% increase over last year, resulting in more competition for every brewery out there. Out of those 6,647 entries, only 91 Gold Medals were awarded, and we couldn’t be more proud of our brewers for earning two of them. One was for our signature LightSwitch Lager brewed in our new Temple brewery, which represents Temple’s first medal in their first GABF. The other gold medal was for our new seasonal Magnolia’s Peach brewed in Chandler, where we have quite a history of brewing medal-winning beer. So please raise a glass BJ’s award-winning beer and toast to our brewing teams in Temple and Chandler for their big success at the 2015 Great American Beer Festival!